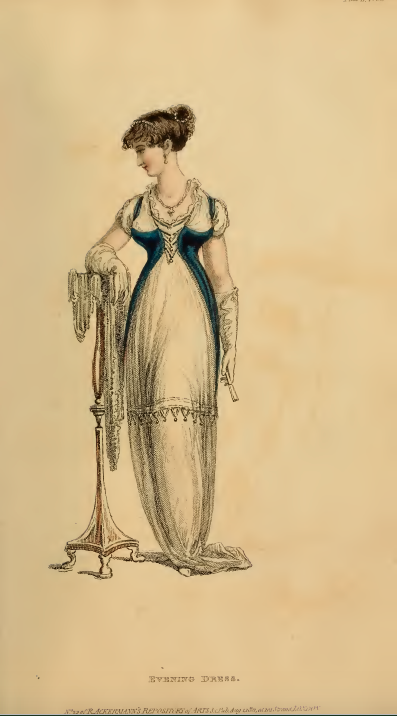 Walking continues to be popular amongst the ladies of fashion; for the third month in a row, Ackermann’s fashion plates feature a walking or promenade costume. Autumn is in the air; our walker this month appears in a few more layers (and a higher neckline) than last month’s did. And the hat of our reader is adorned with “autumnal flowers” as well as matching blossom-colored ribbons. 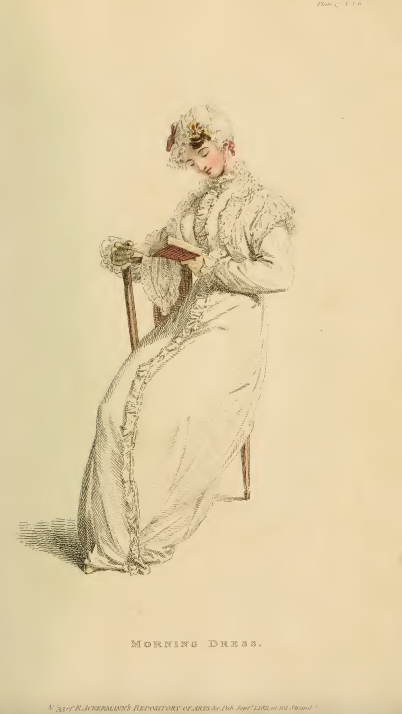 Do you think all those ruffles might prove a distraction from her book? 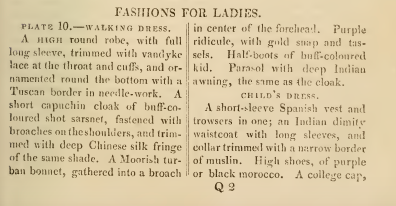 Only a small extra note this month, noting the “complete revolution” in ladies’ shoes. Though we hear that “Rodwell’s brass military heel and copper fastenings are quite the ton,” as is “the gold and jet clasp to the regent slipper,” we have no pictures of same, alas. Perhaps some might be on display at the Victoria & Albert Museum’s special exhibition, Shoes: Pleasure and Pain. Alas, the exhibition ends this week. Have any readers had a chance to take it in? I’ve never heard a color described as “chaste,” have you? But this month’s fabric sample (#1) is so-labeled, in reference to the myriad choices of trim one can pair with it. How odd! 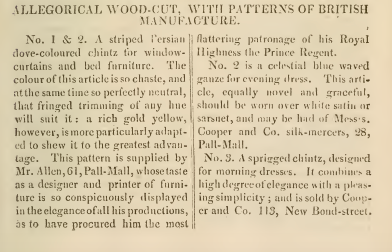 The fabric itself, a striped chintz suitable for window or bed curtains, is lovely, and it is made by Mr. Allen of Pall Mall, whose skills have “procured him the most flattering patronage of his Royal Highness the Prince Regent.” Yes, you, too can shop where the prince does! 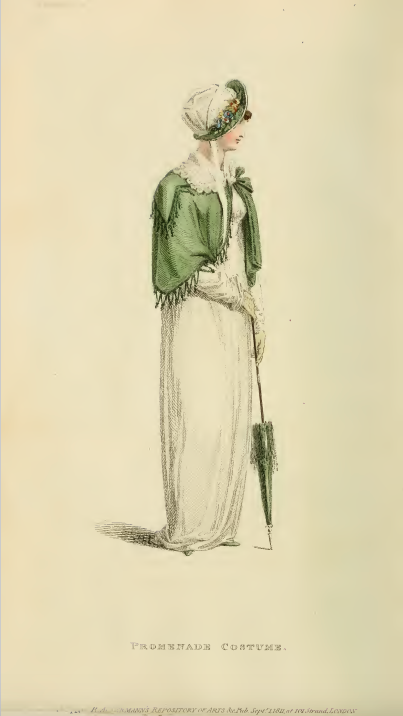 Arbiter Elegatiarum must take the summer off; no words of fashion wisdom appeared in July 1811’s edition, nor in this month’s. The elegant ladies are off to the seaside, too, if the background and foreground illustrations in the first plate (sailboat and seaweed) are to be our guide. 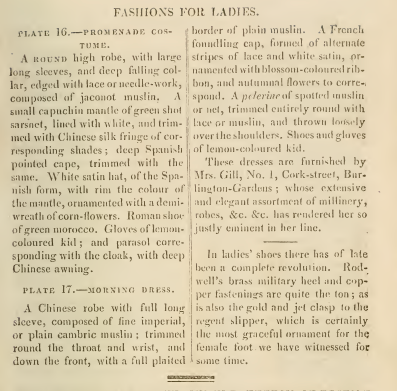 I’m still wondering if there was any meaningful difference between a “Promenade Dress” (see July 1811 post) and a “Walking Dress.” Anyone have any info here to share? July’s plate featured a “youth,” but this month we’re back to a “child.” Although said child appears to be a boy, given his outfit. While it is described as “a short-sleeve Spanish vest and trowsers in one,” it has the look of a “skeleton suit,” a tight coat or jacket buttoned to a pair of high-waisted trousers. 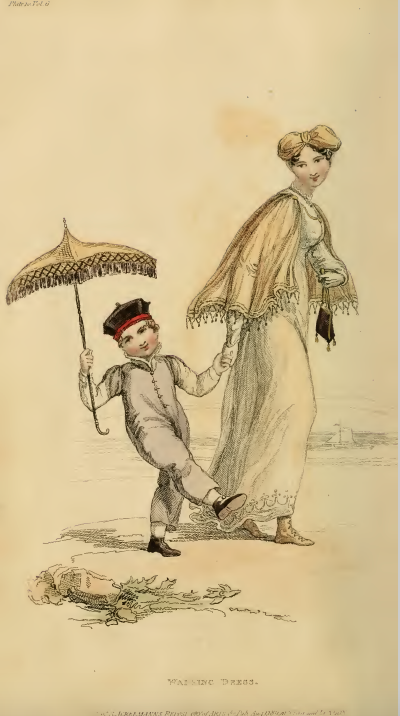 Skeleton suits, popular from the 1790s to the 1820s, were one of the earliest fashions to be designed specifically for children, rather than being an adult fashion simply made to a smaller size. Our child also sports a “college cap” of purple velvet, with a crimson band. As both Oxford and Cambridge’s official colors are blue, I wonder what university this young boy hopes to one day attend? Perhaps his colors indicate his preferred college within one of the universities? The colors of this month’s fabric samples seem to have faded badly over time, at least in samples #3 and 4. “A celestial blue pencil muslin” appears brown to my eye, although I can just make out the hint of pink in the muslin of #4. But those embossed dots are supposed to be green? 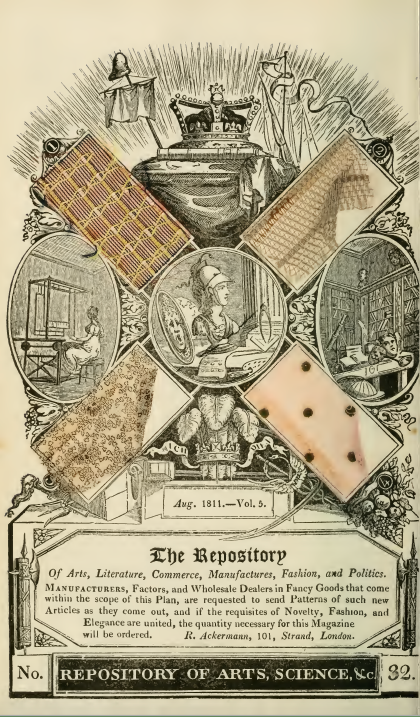 Such an “animated article” as the pink with green spots should be “confined to the more youthful females, to whom it is most becomingly adapted,” the description asserts. 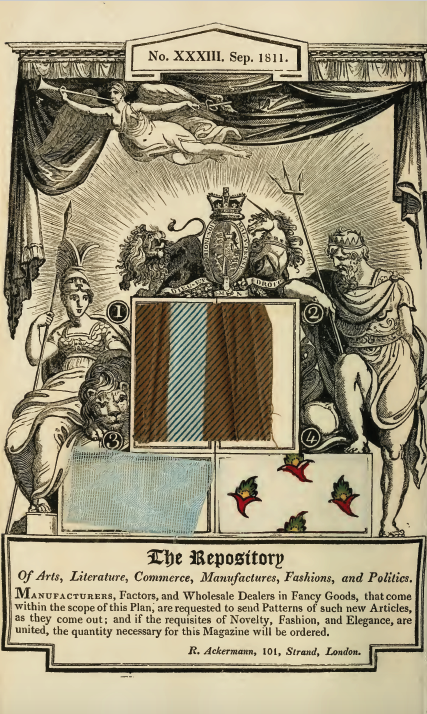 The “leno” fabric in sample #1 refers to a weaving technique in which warp yarns are arranged in pairs. Leno woven fabrics have an open weave, but one that is firmer and less prone to tearing due to this pairing (thanks to Fairchild’s Dictionary of Textiles for this information).